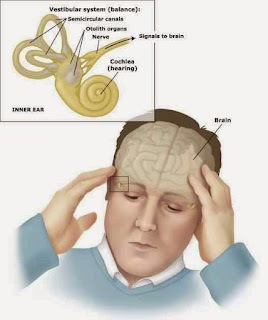 Dizziness or Vertigo is a balance disorder caused by damages the posterior semi circular canal of the inner ear or due to dysfunction of the vestibular system. It is also refers as a whirling or spinning condition. It is a scary disorder when a person faces some spinning and whirling situation and loss their stamina as well as concentration. He/she may also experience a sensation of nausea, vomiting or loss of balance. Some of the common symptoms include loss of balance, dizzy spells, nausea and vomiting. It may be like as a suffocation environment and Perspiration exfoliation on a normal temperature. Vertigo or dizziness can be caused by low blood pressure, diabetes, allergic infection, viral infection, head injury, pressure in the inner ear fluids, chronic migraines and medication reaction. Also it may be a result of excessive consumption of alcohol, excess of smoking, dehydration, unhealthy diet and sedentary lifestyle. Several home remedies and healthy diet that helps to prevent from dizziness and vertigo. Here are some effective home remedies to treat vertigo and dizziness. These remedies are very effective to treat the symptoms of dizziness and vertigo. You can try them to get healthy life. Gooseberry (amla) and coriander is the best natural remedy for vertigo. Soak a teaspoon of both gooseberry powder and coriander powder into a glass of water at night before sleeping. Strain and drink it in next morning. You can also add some sugar candy to make a good taste before drinking. This remedy is beneficial to cure vertigo and also get rid from suddenly darkness around the eyes. Repeat regularly for couple of weeks to get effective. Ginger has been used in Ayurveda remedies since thousands of years. It has used for treat dizziness, nausea and many more. It is a natural antiviral, antibacterial agent. Drink a teaspoon ginger juice on an empty stomach or chew a small slice of fresh ginger to get effective results in dizziness or vertigo. Ginkgo Biloba is a also a natural herb that helps to cure vertigo. It works to boost blood flow to the brain, which eliminates the symptoms of vertigo. You can use it to boost the blood circulation in inner ear to solve all the problems related to ear. Take a teaspoon powder of ginkgo biloba with water or drink juice of it. It would be a better natural treatment for vertigo. You can also use this treatment to control the blood pressure level. Mix two teaspoons of apple cider vinegar together with two teaspoons of honey in a glass of water. Drink it thrice every day to cure from symptoms of dizziness or vertigo. Healthy diet plays a vital role to stay healthy and fit. Eat more iron supplements to eliminate the symptoms of vertigo. Eat vitamins and protein rich foods with including green leafy vegetables, salad and fruits. Healthy diet and proper lifestyle is the key to live healthy. 1. Drink 8 to 10 glasses of water every day to stay hydrate. 2. Drink celery juice is also beneficial to treat from vertigo. 3. Focus on any place or building when you feel the onset of an attack of vertigo. 4. Avoid fried, salty, oily and fast (junk) foods. 5. Stop alcohol and smoking. 6. Fewer coffee and tea intake. You should drink green herbal tea instead of them. 7. Slow and long breathing when you feel the dizziness or vertigo. 8. Try to do some Yoga poses and meditation every day. 9. Get plenty of rest or sleep to refresh your body. 10. Live happy and cool to away from stress. These remedies will helpful to you. If you are in more trouble, consult your family doctor to get a proper diagnosis and treatment. can i use powder of amla and dhania instead of whole? You can use this, because adding the sugar is only for make a good taste. But you should follow the rest of treatment method.